Han, Xiaofan Klinger, John Snabes, Patrick and Li, Alice 2016. Namibia and the United Nations: A Turning Point in the Understanding of National Sovereignty. Open Journal of Political Science, Vol. 06, Issue. 04, p. 466. 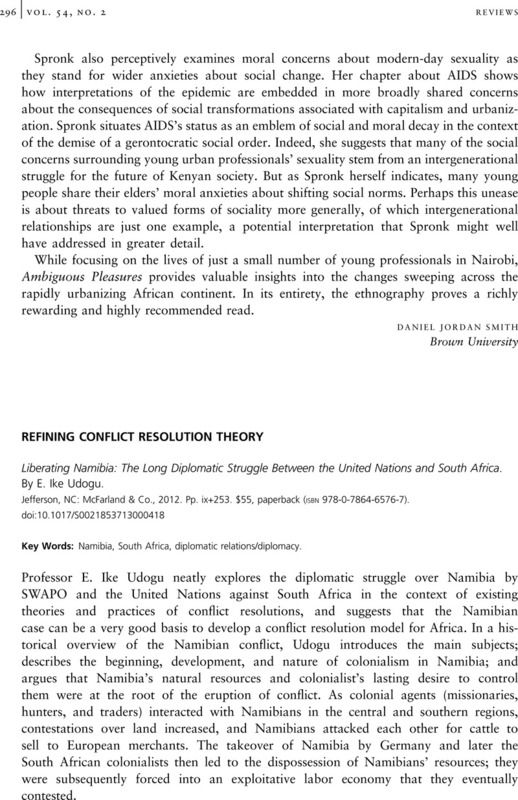 REFINING CONFLICT RESOLUTION THEORY - Liberating Namibia: The Long Diplomatic Struggle Between the United Nations and South Africa. By E. Ike Udogu. Jefferson, NC: McFarland & Co., 2012. Pp. ix+253. $55, paperback (isbn978-0-7864-6576-7).